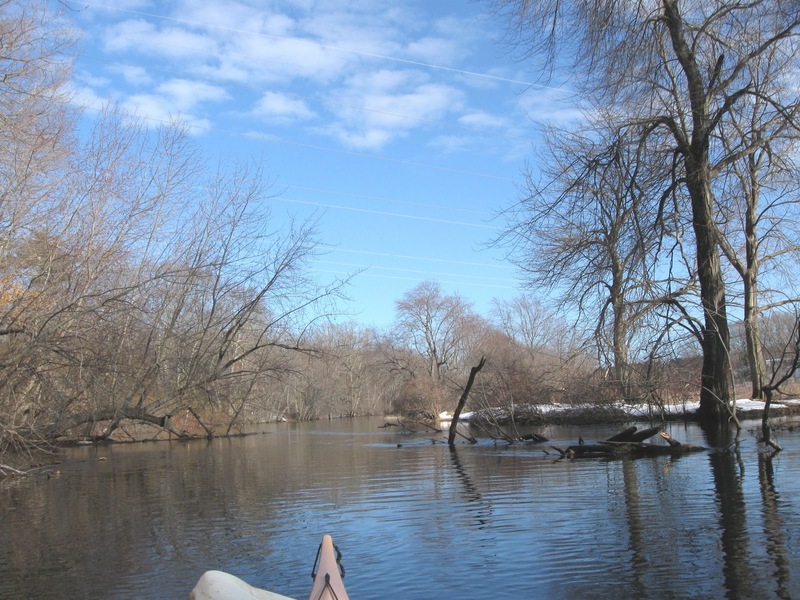 It sure felt like spring out on the Sudbury River today. Warmer temperatures, a little sunshine, and open water. In fact lots of open water as the river is full and flowing with a strong current. Most of the usual critters were in attendance such as wood ducks, mallards, Canda geese, many robins, red-winged blackbirds (heard but not seen), belted kingfishers, and a marsh hawk. 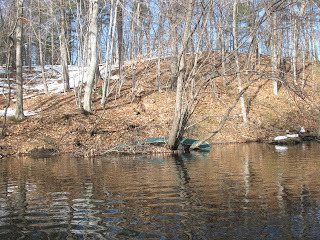 Good thing this canoe was chained to the tree at the hill's base. 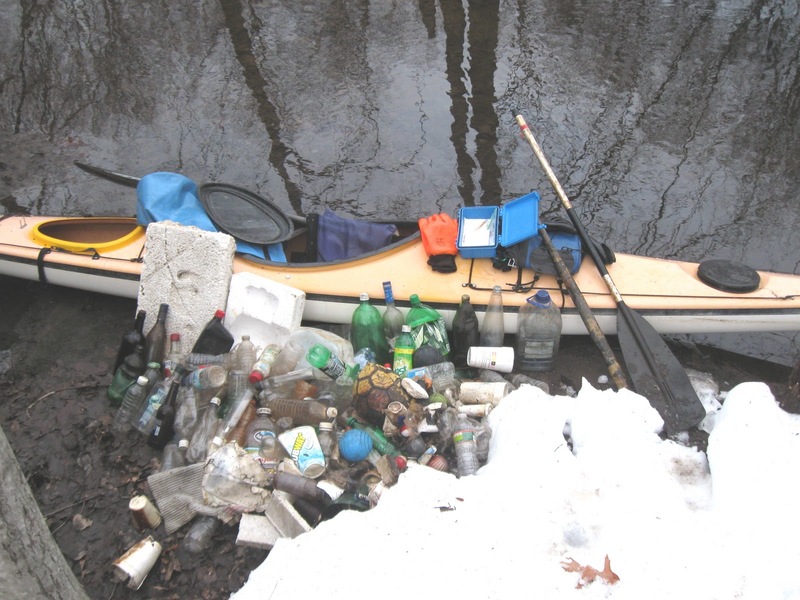 There were 148 pieces of trash and the breakdown was as follows: 87 recyclable containers (13 redeemable) and 61 pieces of miscellaneous rubbish such as styrofoam, nip bottles, a plastic bat, and a canoe paddle. My YTD total stands at 322. At the old stone bridge I encountered a young fellow who related a canoeing/fishing mishap that befell him, his father, and brother last year. Their boat and almost all of their gear was lost. The canoe was later recovered downstream, and this past fall, I came upon one of their tackle boxes, which I will be returning to them soon. From his description of the event, they were very fortunate to make it safely out of the river on that day. Wow that is quite the trash load. 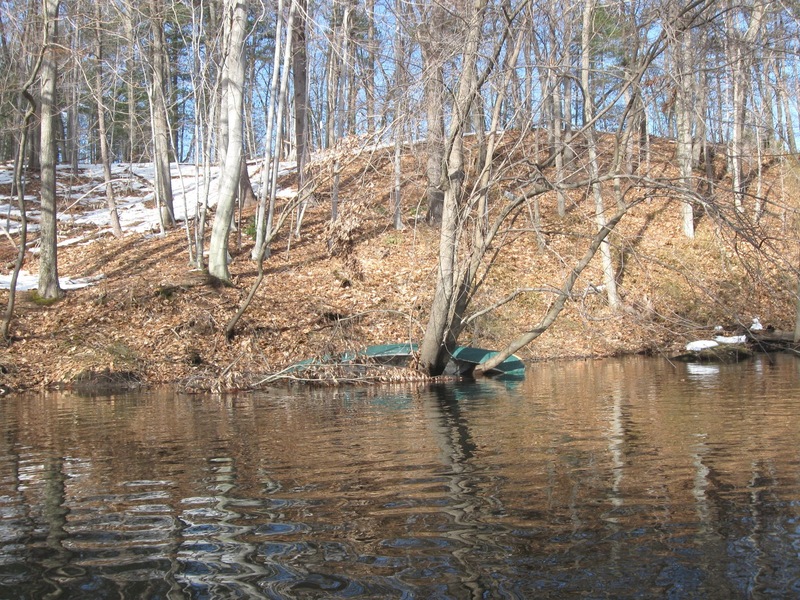 You are going to need a floating trailor soon. 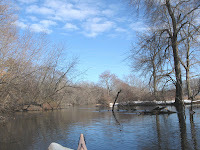 I see a lot of fishermen on the river and they never seem to be wearing PFD's. Always makes me nervous. Ice seems to be going fast now - won't be long and everything will be open.